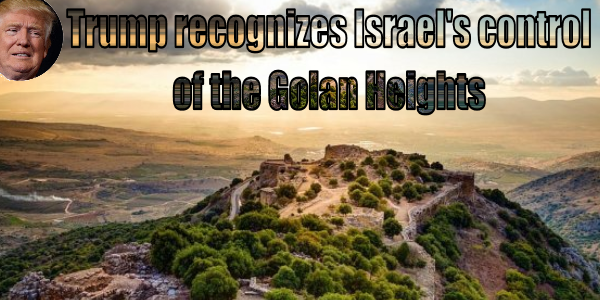 US President Donald Trump reversed past US policies and recognized Israel’s sovereignty over the Golan Heights, which Israel won in a war in 1967. It has been Israeli territory for more than a half-century, and claims of others to the contrary exists only in fantasies espoused by Israel’s enemies. Trump’s proclamation came as Israeli Prime Minister Benjamin Netanyahu was visiting the USA, and Netanyahu stated to Trump: “Mr. President…Israel has never had a better friend than you” (first link). Besides recognizing Israeli ownership of the Golan, Trump has renounced the Iranian treaty that was anti-Israeli and anti-American and moved the formal US embassy to Jerusalem–recognizing it as Israel’s capital city. Since no previous American president took such actions, Netanyahu’s praise seems quite apt. However, the Trump-Netanyahu meetings were cut short when Hamas began another round of firing rockets into Israel in the hopes of killing Israelis and doing significant damage. The second link offers a report on the status of the hostilities as this post was being written. Reports of an Egyptian-brokered cease-fire have so far proven to be premature as Hamas rockets continue to be fired at Israel and Israel retaliates with air attacks on targets in Gaza. The second link has a variety of visual items including details of a Hamas rocket which landed near a FOX News crew. One Hamas rocket destroyed an Israeli home, peppered 30 others with shrapnel and hit cars with shrapnel as well. The third link contains Netanyahu’s condemnation of the Hamas attack as well as the information that Israel is sending two combat brigades to the Gaza-Israeli border region. This may be the prelude to another Israeli-Hamas war. It is not yet clear if this initial exchange of fire will escalate into open warfare or whether it will be defused. What is very interesting to me is that while in the past, a host of Islamic nations would rush to condemn Israel whenever an Israeli-Hamas battle erupted, this time the Islamic opposition is muted. It seems to be limited to just Turkey, Iran and Syria, according to the fourth link. This is significant. Iran and Syria are in the Shiite Islamic bloc, to which Russia is allied, and Turkey is sliding into Moscow’s orbit with its purchase of a Russian air defense system constructed to shoot down NATO aircraft. How long Turkey will be allowed to stay in NATO given its anti-NATO stance is a valid question. What is significant is that the Sunni Arab nations are offering little or no opposition to Israel’s response to the attack by Hamas. I think this is a clear indication that the Sunni Arab nations, threatened by Iran, have no motive to help Hamas, which has been cozy with Iran. It also indicates that Israel and the Sunni Arab nations are steadily assuming the position of allies against Iran and its proxies. It has long been stated and assumed that Hamas is obtaining its missiles and rockets from Iran via smuggling operations and via building rockets of Iranian design inside Gaza. Did Iran order this latest Hamas rocket attack vs Israel? The fifth link offers a report from the Israeli media that Iran did order this Hamas strike. Indeed, it cites senior leaders in Hamas as openly acknowledging that Iran ordered this rocket attack on Israel. The motive given was to hurt Netanyahu’s re-election chances in the pending election to be held in Israel. It is my view that this attack will likely have the opposite effect. By focusing on the gravity of the threat Israel faces from hostile neighboring border regions, it will likely focus the Israeli voters’ attention on security issues–which should help Netanyahu. The claim that Iran directed this rocket attack vs. Israel significantly raises the stakes in this latest confrontation. Rather than this latest confrontation being a result of the longstanding Israeli-Hamas animus, it means that Iran has chosen this moment to advance its stated agenda of wiping Israel “off the map.” This also means that Israel has every right to retaliate militarily against Iran for this attack as it has reason to believe that Iran ordered it. It is not certain that Israel will do such a strike, but it has ample justification to do so at the present time. The Iranian backing of this latest Hamas attack makes the situation perhaps more likely to progress into a larger Mideastern war, but I suspect that none of the major potential combatants really wants one at this time. However, that is just my guess; we’ll have to wait and see what happens. It is likely that Iran was simply testing Israel’s resolve at this time when Israel’s population is divided into separate electorate camps during the current election campaign. The continuing conflicts along Israel’s border with Hamas and the American recognition over Israel’s sovereignty in the Golan do have a Biblically-prophetic significance. In many previous posts over the years, I’ve called attention to the prophecy in Zephaniah 2:1-11 which foretold that in the latter days of this age (i.e. “before the day of the Lord’s anger”), the Jews (“Judah”) would again have a national homeland of their own in the former Promised Land. This ancient prophecy accurately predicted that the new Jewish nation would include the Mediterranean coastland and the city of Ashkelon. This approximately 2600-year-old prophecy was precisely fulfilled in 1948 when the new Jewish nation was founded. Its new territory included the Mediterranean Sea coastland and the city of Ashkelon. This precise fulfillment proves that only a Creator God with the power to control the fates of nations could have authored this ancient biblical prophecy. However, there is one aspect of Zephaniah’s prophecy which is often overlooked, but it is very germane to the current Israeli-Hamas conflict near the Gaza border and the Golan Heights dispute along Israel’s northern border with Syria. Zephaniah 2:8 foretold that one aspect of the latter-day Jewish nation would be that it would have hostile neighbors who would “magnify themselves against their border (emphasis added).” Does this sound like the history of the Jewish state going back to its founding? Israel has had numerous border wars and conflicts as well as border disputes since 1948. The current confrontation with Hamas at the border of Israel and Gaza and the formal recognition of Israel’s control of the Golan Heights at its border with Syria further fulfill the prophecy of Zephaniah 2:8. Hamas is “magnifying itself” vs the Israeli border with Gaza, and Syria is “magnifying itself” vs Israel in the Golan region. Zephaniah 2:9-11 warns that God will deal severely with those peoples who contend with the modern Jews (“Judah”) about their borders. Verse 9 of Zephaniah 2 also has another piece of prophecy which fits the modern era. It describes the latter-day Jews in the time that they will again have a new nation in the old Promised Land as being “the residue” or “the remnant…of my people.” That is a very appropriate description of the Jewish survivors of the Nazi Holocaust of World War II. They were, indeed, only a remnant of the pre-Holocaust Jewish population. As a personal aside, I will offer my conclusions about the Golan Heights issue based on my visit to that region in August of 2000. On one night during my trip to Israel, I stayed with several Jewish friends at a room in a kibbutz named Ha’ Gosherim. We arrived in the dark, but in the morning I could see the dominating presence of the Golan heights towering over the northern part of the Israeli nation. It was so dominating that it almost has to be seen personally to be understood. I could easily see that the Israelis could never allow Syria to ever again have control over the Golan Heights. From that lofty firing position, the Syrians could fire artillery at much of northern Israel (as they once did before Israel took control of the Golan). If the Syrians had control of the Golan, they could fire modern missiles at all of Israel. It would be suicidal for Israel to yield control of the strategic position to such a sworn enemy as Syria–especially since Syria is Iran’s close ally. I applaud the action of our President, Donald Trump, in recognizing Israel’s sovereignty over the Golan Heights. This post has addressed the very warm relationship between the USA and the Israeli nation. For more in-depth information about both nations in biblical prophecies, please read my free articles, Four Reasons the Jews are Judah, and The USA in Biblical Prophecy. For abundant evidence that we are living in the biblically-prophesied latter days, please read my free article, Are We Living in the Biblical Latter Days?